When I hear a lot of meat-eaters raving about a burger place, I’m always extra curious to try their vegetarian offering(s). 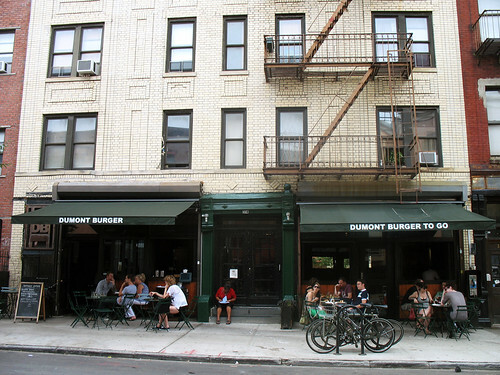 And DuMont Burger has quite a reputation for its meat-burgers (the two guys in button-down shirts sitting next to me at the bar couldn’t stop raving about their burgers as they ate them – one declared that he felt “drunk on a burger” when he had finished). The funny thing is, when you get to this restaurant and look at the menu, the veggie burger is not listed under “Burgers”. My heart skipped a beat at that absence – until I saw “Chickpea Burger” beneath the heading “Everything Else”. Kind of an odd placement, like DuMont is embarrassed to admit that they included a burger for us vegetarians. But I guess we can’t complain too much, right? At least it’s on the menu somewhere. 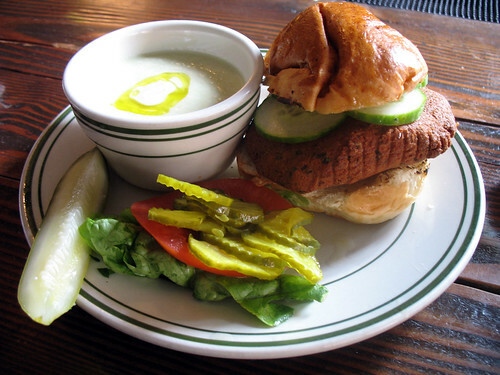 Here is something I have learned after much eating of veggie burgers in NYC: “Chickpea Burger” is code for “falafel burger”. Now, I love falafel. And I don’t think falafel burgers are a bad idea… But, as I explained in my review of GO Burger, it’s just not quite the same as a regular veggie burger – and at the end of the day, unless it’s absolutely mind-blowing, I’d rather just get a normal falafel sandwich from a street vendor. So, I felt a bit disappointed that a place whose meat-burgers get such rave reviews didn’t try harder to offer a more unique veggie burger. Especially when it comes with such a high price tag. Those factors aside though, the burger was good. They certainly perfected the falafel flavoring, although I thought the patty was a bit too thick. Since falafel is often rather dry (although at least this one was nice and crispy on the outside), it would have been easier to eat the burger if the patty was a bit thinner. 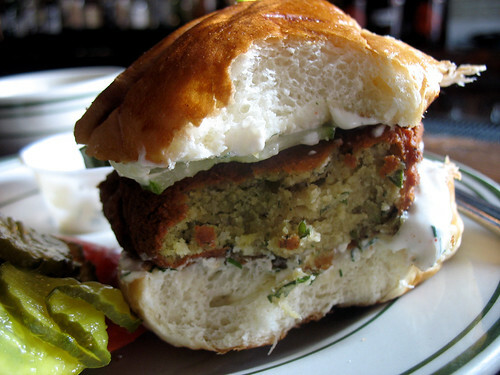 The bun was soft and sweet – too sweet, I thought, to be paired with falafel. It was just an odd mix of flavors that did not sit well on my tongue. The toppings were delicious – the tatziki-style garlic-dill sauce was great and helped combat how dry the thick patty was (although to get a vegan burger, you’d have to go without the sauce – and I’m not sure they have a vegan substitute, so you’d be stuck with a very dry burger!). The lettuce, tomato, and cucmumbers were good, but the pickles were scrumptious – although I admit I felt that the burger already had enough different flavors competing, so I just ate the pickles separately. I will also give DuMont credit for the variety options they offer as sides with the burger (included in the price) – fries, onion rings, or the soup of the day. I had a cup of white gazpacho, which was tasty, but I should have eaten it before the burger as I ended up being too full to finish it... I know, I know, soups are meant to be eaten before main courses – but I get a bit ahead of myself in my excitement to review a new burger!